This terrible anniversary was marked by Friday’s National Memorial Service in the Great Hall of Parliament House Canberra, in the presence of politicians, dignitaries and, most importantly, the families of the bereaved. It included the unveiling of a plaque to be later mounted in the Parliament House gardens adjacent to that honouring the Bali Bombing victims. The task of establishing accountability for the MH17 missile shoot down from a height of 33,000 feet continues to drag on. It occurred during bitter land and air fighting between Ukrainian centralist and separatist military forces in the battleground of Eastern Ukraine. An early Western consensus view, underpinned by a firm and clear statement by US Secretary of State John Kerry, held that there was ‘overwhelming evidence’ that MH17 was downed by a Russian missile fired from Russian-supported insurgent territory. Kerry said this was based on both US satellite imagery, which he described as the most important source. Additionally there was ‘those chilling telephony intercepts’ published by Ukrainian sources shortly after the shootdown, of pro-Russian insurgent conversations. At that time, I accepted that Kerry’s statement was factually correct. Soon afterwards, Moscow offered several counter-versions, claiming the the telephone intercepts were forgeries. It asserted that Ukrainian central government forces had the same kinds of surface-to-air missiles as Russia, and no one could know where such a missile might have been fired from. Moscow accused Ukrainian land forces of an accidental or deliberate shoot down. 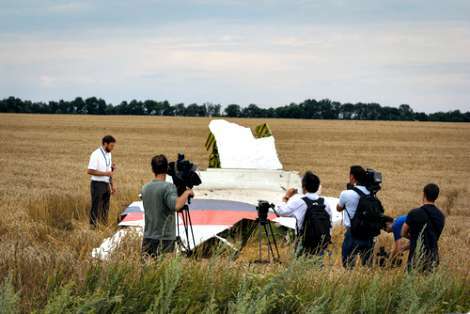 It posited that MH17 could have been destroyed by an air-based missile, and that Ukrainian fighter planes equipped with such missiles were in the air nearby at the time of the shootdown. Moscow made unsuccessful demands to view the US satellite imagery that Kerry used to justify his conclusion. An international investigation team that was led by the Dutch Safety Board and included both Russia and Ukraine and the victim countries, published an interim finding on 9 September. It said the crash had been caused by ’high energy objects ‘ striking the plane from the outside. This finding was important in that it ruled out aircraft failure or pilot error and indicated a missile explosion. But it left open the question of whether it had been an air-to-air or surface-to-air missile. Australian prime minister Tony Abbott was forceful in his continuing to argue for the Western version, confronting Vladimir Putin on the sidelines of the APEC Summit in Beijing on 12 November. He told the Russian President that Australia held information suggesting MH17 was destroyed by a missile from a launcher that had come out of Russia, was fired from inside Eastern Ukraine and was then returned to Russia. By April 2015, crash wreckage and remains had been mostly collected, with the focus of the Dutch Safety Board-led investigation shifting to establishing the culprits, with a view to prosecution. Reuters reported that prosecutors were ‘testing the theory that the plane was shot down by a surface-to-air BUK missile fired from an area held by pro-Russian forces’. By now, Western governments were losing patience with the slow progress of the Dutch Safety Board-led investigation, which was not expected to finally to report until October 2015. It was said that international politics were slowing progress in producing an agreed final report. A separate Western-led criminal investigation got underway. This was made up of representatives from a range of nations including Australia, Belgium, Malaysia, Netherlands and Ukraine, ‘supported’ by the US and UK and ‘in parallel’ with the Dutch Safety Board-led investigation. In other words, a coalition-of-the-willing type of Western initiative. Then on 14 July, Malaysia, supported by Australian Foreign Minister Julie Bishop, called on the UN Security Council to support the setting up of a UN Security Council authorised international tribunal to bring the perpetrators to justice. Russia and China responded that there were no grounds to set up such a tribunal, and of course it cannot proceed without their support in the UN. A Russian Investigative Committee continues to claim that MH17 was, in its view, most likely to have been downed by an air-to-air missile that, they now claimed, was not Russian-made. For their part, Western commentators became increasingly impatient and scornful of Russian ‘conspiracy theories’ on who downed MH17 . The full truth of who shot down MH17 may or may not become known in the fullness of time. As the cliche tells us, truth is often the first casualty in war – and certainly Cold War as well. Now the Cold War between Russia and the West in rapidly escalating. Meanwhile it is seemly that the Australian Memorial Service on 17 July at Parliament House has been conducted with dignity and respect for the grieving, with a particularly impressive speech from Opposition Leader Bill Shorten. It is unfortunate that other speeches were not completely devoid of prejudging of responsibility and political point-scoring. MH17 wreckage image by Shutterstock. Thanks for this, Tony. I could not agree more. Of particular concern is that the Ukrainian Government has been invited to participate in both enquiries but the separatists have involved in neither. The Russian Federation is, of course, a party to the Dutch investigation. Nevertheless, the Russians are not the separatists - both have separate interests and not even the most anti-Russian narrative actually accuses the Russians of pulling the trigger. This creates credibility problems right from the start. Given that both sides (Ukraine and the separatists) stand accused in one or other version of the story, there will inevitably be a sense of partiality if the separatists are accused (no matter how credible and painstaking the investigation). I am sick to death of some deaths being important while the slaughter of 50 Australian women by their partners doesn't even get mentioned. What is going on here; more Russia apologetics? It seems now almost indisputable that the BUK was Russian and fired by "their" poorly trained cowboy militias who should never have had it. They may well have thought that they were firing on an Ukrainian fighter plane, and that passenger aircraft were no longer using that airspace, but it was still inexcusable cavalier. Stuff-ups win again, but what were the Russians thinking to introduce that sort of deadly high-technology into the arena? Marilyn`s comment is more cruel than inane. In reading Tony Kevin’s quiet, reasoned refusal to join the zealous rush to judgment on the fate of MH17 we need to bear in mind that such contrary views would have risked demotion or even dismissal from some publicly-funded Australian media organisations ? witness events at SBS last April. Even those who do not agree with Mr Kevin’s analysis (I do, mostly), should be given pause by this disturbing trend to have all of us join Team Australia, and straighten up and fly right. Given how much political capital and credibly the US and its allies (not least our present PM), have invested in the Russian BUK story, it is hard to imagine how a different or more complicated version of events can be permitted to emerge from the evidence. The families and friends of those lost on MH17 (and let us not forget those others still wondering about loved ones on MH370) deserve our unreserved compassion and sympathy. They also deserve the truth. We all do. Meanwhile, the bellicose rhetoric and the arms race escalate as the death toll in the Dombass steadily rises. Thanks in particular to Justin Glyn and H A Willis for their helpful comments. I would like briefly to comment further on Willis's points. He/she is right that any journalist would find it quite difficult at this time to present in the mainstream media any commentary on the present state of East-West relations that did not take as its starting point the proposition that Purin is a new Hitler. This mindset - sedulously fostered over the past few years , even before the Ukraine crisis erupted at the time of Maidan - is the product of an American world view that any country that does not fall in behind America's vision for the world is a potential threat. The Magnitsky case ( see Wikipedia) marked the beginning of a serious deterioration in US-Russia relations. Since then it has been all downhill, and the West must carry the main blame. Early this year Processor Richard Sakwa published an important scholarly book on the Ukraine crisis. Jonathan Steele’s review in the Guardian on 19 February can be read here http://www.theguardian.com/books/2015/feb/19/frontline-ukraine-crisis-in-borderlands-richard-sakwa-review-account There followed virtual silence. I found mainstream reviews only in the Irish Times by Professor Geoffrey Roberts (25 April) and by Peter Hitchins in the UK Daily Mail hitchinsblog.mailonsunday.co.uk. Nothing in any other leading UK or US mainstream newspaper or even literary magazine eg NYRB, LBR. Sakwa's book - a first class important well-balanced work - has been effectively boycotted in the Western reviewing world, because it challenges the prevailing narrative. I pay tribute to Eureka Street for continuing to publish my commentaries on themes of the new Cold War between Russia and the West and my views on which side is most responsible for it. Where are the academic conferences on this vital subject? Where is Lowy? Chifley? Dead silence. Rt.com, the Russian semi-official internet news site, offers an alternative perspective. Of course it has a pro-Russian bias, but since pretty much all we find elsewhere now has an anti-Russian bias, I find it a useful balance. No doubt, there are some silly commentaries there - it has to be read with discrimination, as any news and comment source does. As a retired freelance commentator, I do have freedom to express my considered views on East-West relations without fear of economic sanction against me. I will continue to exercise that right and privilege. Another Pravda special from this bloke. There is another source of information not raised in the article. They are comments by the pro-separatist forces (disputably Russian troops) on the ground picking through the debris. They are looking for and expecting signs of Ukrainian (enemy) aircrew but find the civilian victims and their belongings. If the separatists had not shot down the plane their conversations would have been somewhat different. These properly translated conversations will provide evidence as to what occurred if truth is to be obtained. But Putin (as most leaders) cares little for truth when gas oil land and sea is at stake. All war is dirty rotten and victimless to the eyes of the protagonist.